Reza Afshar Real Estate is a real estate broker service in Toronto, Ontario. Toronto real estate broker Reza Afshar owns the company. Reza has almost 15 years experience in downtown and central Toronto Condos and Lofts real estate. Products Carried: Reza Afshar Real Estate is a real estate company in Toronto, Ontario. 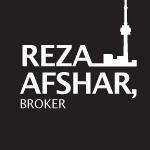 Owner Reza Afshar specializes in downtown and central Toronto Condos and Lofts real estate sales. Reza is a real estate broker with almost 15 years experience in the real estate industry. Reza also provides property management services and helps his clients build their real estate portfolios.